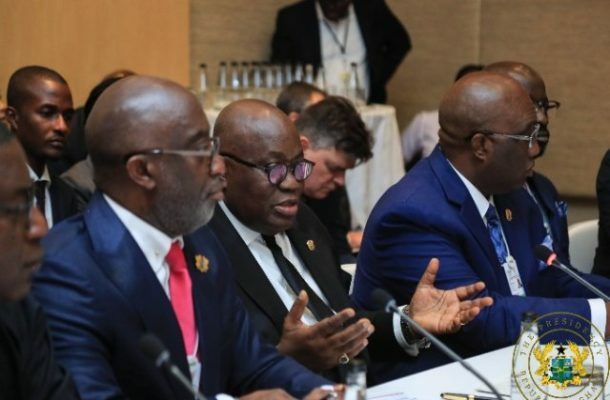 The Railways Development minister Joe Ghartey has signed a Memorandum of Understanding with the Africa Investment (Ai) SkyTrain Consortium, based in South Africa, for the construction of the Accra Sky Train Project. “There is confidence in the project. The promoters (Ai SkyTrain Consortium) are very serious, and that is why we invited the President, himself, to witness the signing. “This should assure the investors that Government is solidly behind it. The economics of this project are also good. We are very excited about the prospects,” he said. With Accra experiencing ever-increasing road traffic congestion, with its detrimental effects on economic activity, pollution and the quality of life, the SkyTrain project, Joe Ghartey emphasized, is the solution to these problems. The MoU was signed on Tuesday on the sidelines of the ongoing Africa Investment Forum, being held in Johannesburg, South Africa. “Today, we have signed an MoU which will last nine months, where they (Ai SkyTrain Consortium) can do their feasibility into detail. “After which, we have given ourselves 45 days to take our concessionary agreements for approval by Cabinet and also by Parliament. By January 2020, we should start the construction of the project,” the Railways Minister said.